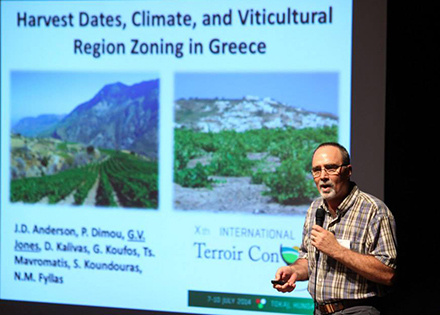 Environmental science professor Greg Jones, seen here presenting at the International Terroir Congress in Tokaj, Hungary, in 2014, led the charge to bring the event to Oregon in 2016. Ashland, Ore.—The call for papers is out as Oregon wine country opens its doors to the world for the biennial congress of the Society of International Terroir Experts, which will meet July 10-14, 2016, in McMinnville, Ore. Organized by Southern Oregon University in Ashland and hosted by McMinnville’s Linfield College, the International Terroir Congress is making its North American debut in a region many delegates have heard about but most haven’t visited. Previous congresses have heard about the Pacific Northwest, thanks to the work of Jones and others, including Whitman College professor Kevin Pogue, who discussed the Columbia Valley at the congress in Soave, Italy, in 2010 (see “Columbia Valley Terroir Goes to Italy”). Pogue presented a paper about the influence of basalt on the terroir of the Columbia Valley AVA, specifically its influence on soil temperature, cluster temperature, vine chemistry and other attributes. Jones’s international colleagues clearly were hankering for a reason to visit the region, however, so much so that necessity became the mother of invitation. During the last congress in Tokaj, Hungary, Jones threw Oregon into the ring against a Spanish venue, and it was selected. McMinnville’s proximity to Portland made it an ideal location in Oregon, as did Linfield College’s long engagement with the wine industry through the International Pinot Noir Celebration, which is in its 30th year and has demonstrated the ability to handle large meetings. And, of course, being in the heart of the Willamette Valley helped. That mass is indeed critical for the terroir society, which has typically made a point of spending half its meeting time in the lecture hall and half investigating the local terroir. Jones is planning for conference sessions to run through noon each day, with field trips planned for the afternoon. “We’ll be digging soil pits, letting people get down to talk about the geography, tasting wine that comes off of different landscapes…really getting these scientists—who are international in scope—seeing Oregon first-hand,” Jones told Wines & Vines. While local cognoscenti may quip that wines reflect an “Ore-gundian” style, Jones said Oregon is too often lumped in with the rest of the West Coast, especially California. And those who know it’s not California aren’t quite sure what it is. That’s where the field trips come in—not to mention scientific presentations, which are currently being solicited. Presentations examining the terroirs of Oregon and the Pacific Northwest are especially welcome, alongside those examining the climates of international wine regions. The geological and viticultural influences on terroir are also fair game for participants. Jones expects papers to run from high-level examinations of terroir-related tourism and the economic spin-offs of such activities to those that hone in the microbiome of the vineyard. Ideally, papers will—like the field trips—consider both the physical and cultural aspects of terroir to ensure a well-rounded understanding of the concept as both a viticultural reality and one with appeal among consumers. Based on past congresses, Jones expects 150-180 participants, though the exchange rate will be key for participants from Europe. The euro has plumbed historic lows against the greenback this year, making travel to North America expensive. “I have a feeling my European colleagues will travel pretty well for this, but a lot of it will depend on the economy,” he said. However, if conference location works against this much-desired opportunity for overseas scholars, it could attract a record number of U.S. participants. Jones expects half the participants next year will be from the United States.